How many of you watched Super Bowl 50 this year? For those that know me, I am a Pittsburgh Steelers fan, so I didn’t have a favorite team. To me, I was just watching the game for the love of the sport. When the day started on Superbowl Sunday, I did not expect to learn a valuable leadership lesson from the whole event. But I did. Two things happened on this day. And both involved interviews with the QB from each of the two teams that were playing in the Superbowl. If you’re not a football fan, the QB is the leader of the team on the field. They understand the plan for the game, and they work with the coaches to define the plays that they are going to execute in the attempt to win the game. The first thing that I encountered was a pre-game interview with the Denver Broncos QB Peyton Manning. When you see someone like this be so successful, it’s hard to believe that a person with this much success could be humble and respectful. But in this case, Peyton is one of those great players that fans of other teams hated to love. Football fans like me show their support for their team by despising the great players and star players from the other teams. But in the case of Peyton, he’s one of those players that everyone respects, regardless of their selection of a favorite team. What would be the legacy that Peyton Manning wants to leave behind? Two of the most important things to me would be that my teammates said that I was a great teammate. That’s important to me. And, I think, the coaches that I played with and I played against would say that they respected me. That would be important to me. That’s something that my dad always told me to strive for. Earn the respect of your teammates. Earn the respect of the coaches that you played for and that you played against. So that would be the most important thing to me from a football standpoint. I’ve worked hard for that and I hope that I can maintain that and keep that in tact. On the other team was our star Carolina QB, Cam Newton. He’s young, he’s fresh, he’s excited about football, and he has been quoted as saying that football has always been his life. While some players saw football as something they did, Cam saw football as something he ‘was’. His interview lasted only a little more than 2 minutes. Many were upset at him for how he behaved. Many were angry that he would not sit there and take the questions and give the fans (his customers) what they wanted. I’ll be honest, my first reaction was disappointment in his behavior. How many of us get to walk out of our job when things are not going well? Have you been in a meeting where you are the center of the discussion, things were not going well that day, and you stand up, walk out without saying anything, and go home? Probably not. Yet this is the job of the players in football, and one of their stars did this very thing. I then began to look back to the other QB, Peyton. I recalled many big games in which he lost, where he would give the media and his fans as much time as they wanted in the interviews after a game in which he lost. A few years ago, Peyton was in the Superbowl and he lost to another team, and this very thing happened. But the story behind all of this is as follows – it took maturity and learning for a veteran like Petyon to handle the pressure, disappointment, and impact of losing a big game. Cam will learn from this loss. And hopefully he will be prepared for the interviews in the event he loses another big game. How can we apply this to our own lives as leaders in our professional and personal lives? What is the lesson to be learned here? Great leaders are not defined by how they behave when things are going great. They are defined by how they handle situations when they are NOT so great. Cam was well known for his celebrations during the game and the leadership he exhibited with a team that seemed unstoppable throughout this past year. He was always smiling, driving, motivating and giving direction to his teammates. But when facing a team that came prepared with a strong defense that would shut down the aggressive attack of the Panthers, Cam was unable to handle it. How many of you have had a ‘bad day’ at work in the last month? If you’re a leader, it’s so hard to keep your head up, and to motivate your team, your peers, and to keep pressing forward. But I challenge you today to keep going. There will be times when you are the only thing that will motivate someone else on your team. And being a leader is a big responsibility. But you can do it! The SECOND lesson is about servant-leadership…. Servant leadership is an unselfish approach to leading others, giving direction, and being part of their success. If you look at the statistics of this Superbowl, you will find that Peyton Manning did not have one of his STELLAR performances. While he holds almost every record you can imagine for a QB, it was not his performance that won the game. It was the performance of his team as a whole. The performance of the defense that broke down the attack of the Panthers. And the performance of the players around Peyton that supported him and took his direction with unconditional trust. You don’t have to be the star of the team. You don’t have to be the one making all of the big plays and doing all of the great work. But if you want to be a strong leader, you will find a way to drive your team with MOTIVATION, ENCOURAGEMENT, MENTORING, SUPPORT, and RESPECT. It’s amazing how we can learn something about leadership in almost everything we do, everywhere we go, and everything we see or hear in the world. My challenge to each of you is to let LIFE teach you how to grow and become a great leader. Look around you, enjoy the times you have, and seek to find a story, an example, and a lesson from what you are experiencing. And if you do that…you just might get that interview at the end of your career…where you can say “I am respected by my peers, my teammates, my manager, and managers on other teams”. Author Mike LylesPosted on March 6, 2016 Categories Leadership & ManagementTags Broncos, cam, cam newton, carolina, Carolina Panthers, Denver, Denver Broncos, football, leader, Leadership, management, NFL, Panthers, peyton, peyton manning, QB, quarterback, super bowl, super bowl 50, SuperBowl, superbowl 509 Comments on How Do You Want To Be Remembered? Playoffs? Don’t Talk About Playoffs!! This weekend the NFL will be featuring the AFC and NFC Championships. Being a football fan, this is an exciting time, knowing that the two winners will be playing in Superbowl XLVII. However, it’s just not the same when your team is not in the race to NFL World Champions. 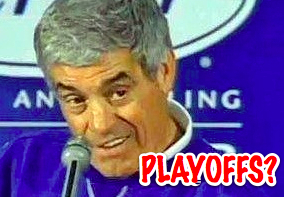 Having the playoffs without your team in them is like going to the school dance without a date. It’s exciting, fun, and you will have a good time. But it’s better if you have someone there with you that you care about the most! So let’s talk about my team, the Pittsburgh Steelers. For those of you who don’t know them well, they are the only team in history to have SIX Superbowl wins. They gave us such great memories in the 1970’s and 1980’s. From the “Steel Curtain” to “The Immaculate Reception”, they have been a team to follow. No, this is not an Emmitt Smith jersey! So you may be asking “Mike, you were born, raised, and live in North Carolina. Why are you not a Carolina Panthers fan?”. First of all, when I was growing up, we didn’t have a team. 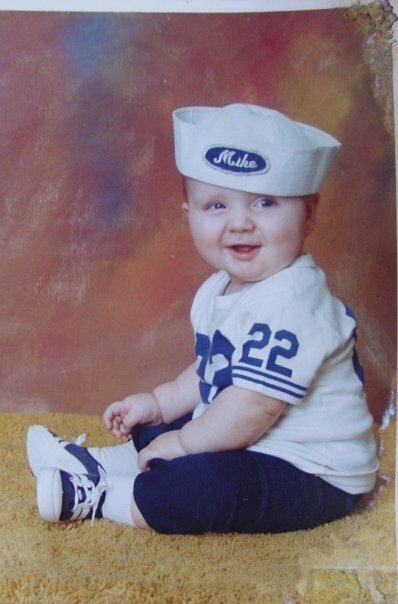 But most importantly, I was raised to be a Steelers fan from the very start. My grandfather, Charlie Lyles, was one of the biggest fans of the Steelers. I spent many Sundays, with my grandfather and dad, watching our team play on TV. Those are memories I will never forget. Growing up, I didn’t know there was even an opportunity to be a fan of any other team. I watched the Steelers play their many rivals – the Dallas Cowboys and the Cleveland Browns were the two that stood out as the one’s to beat. When these teams were playing us, we would sit glued to the TV, cheering on our team to beat the opponent. 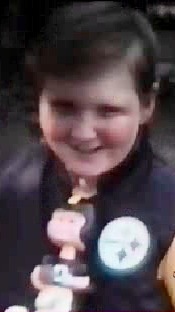 My birthday parties were soon themed as Steelers Parties. And all my friends knew who I felt was the best team in the land. 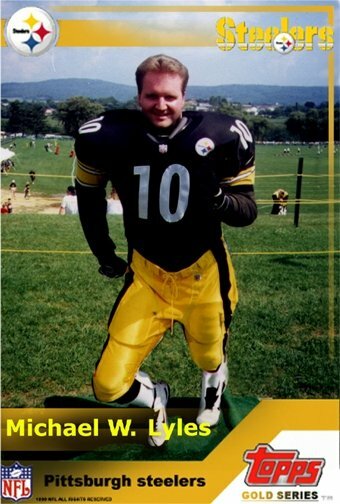 Didn’t Know I Used to Play for Steelers? In 2002, I had the privilege to attend my first AFC Championship game. The Steelers were highly favored to win over the visiting New England Patriots. I remember it was uncharacteristically warm that day – when Pittsburgh saw weather in the 30’s in January, this game was played with the temperature in the high 50’s. The game didn’t go in the Steelers favor, and the Patriots went on to win one of many superbowls in the early 2000’s. (this is when I added the Patriots to my list of rival teams which I could never support). 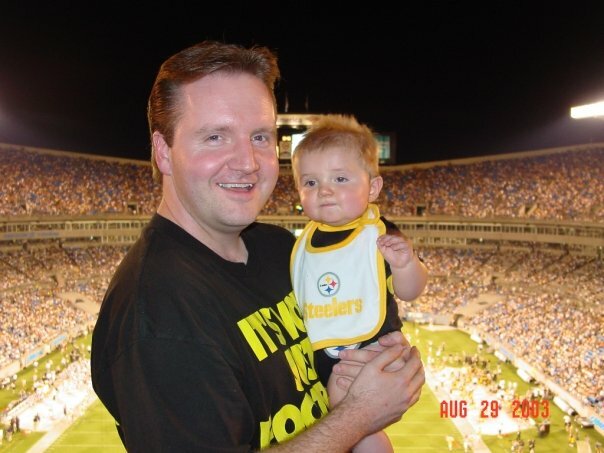 In 2003, my son, Wynston, was born, and in August 2003, the Steelers were visiting the Carolina Panthers. So my young son, at the time 7 months, got to experience his first Steelers game, in a full Steelers outfit, complete with a Steelers bib and bottle. Someday he can blog that his love of Steelers started at birth just like mine. It’s Only Weird If It Doesn’t Work! 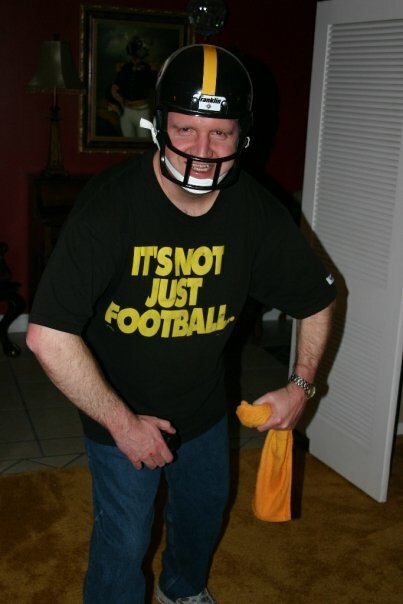 I have a t-shirt, which says “It’s Not Just Football, It’s Steelers Football”. This old t-shirt gets washed in the offseason. Then, when the season starts, I wear it every game, and then hang it up, unwashed, until the next game. I’ve worn it to live games and at home, and I’ve came to believe that it helps them to win. It’s a crazy superstition, but as the commercial says “its only weird if it doesn’t work”. I also have one of the famous Steeler “Terrible Towels”, a small square yellow towel, that has never ever been washed, and I carry it with me for every game. It’s traveled to many live games, and if it were ever lost, I don’t think the Steelers could ever win again. In January 2011, during the playoffs, I watched as the New York Jets defeated the New England Patriots, making the Steelers the host of the AFC Championship game. I called up my friend, John, and we bought two tickets, drove to Pittsburgh, and prepared for the game. It was 9 degrees on the field that night, but the game was one to remember, as the Steelers defeated the Jets and moved on to the Superbowl. Unfortunately, they were beaten by the Green Bay Packers that year. So, as you can see, it’s hard for me to watch the playoffs this year without my team there to cheer on. And two teams who always battle hard with the Steelers (the Baltimore Ravens and the New England Patriots) play on Sunday. Who do I pull for in this game? Can I vote for both to lose? I guess not. With that said, the playoffs these year have been so exciting so far. Close games, double overtime, and historical plays. We can only hope that this continues to happen in the AFC Championship and NFC Championship games as well as the Superbowl. But in the back of my mind, I’ll always wonder ‘what if the Steelers could have made it to the playoffs’. But unfortunately, we’ll never know. Author Mike LylesPosted on January 20, 2013 January 20, 2013 Categories Current EventsTags 49'ers, AFC, AFC Championship, Atlanta Falcons, Baltimore Ravens, Browns, Carolina Panthers, Cleveland Browns, Cowboys, Dallas Cowboys, don't talk about playoffs, Falcons, fantasy, fantasy football, football, Green Bay Packers, Immaculate Reception, Jets, jim mora, New England Patriots, New York Jets, NFC, NFC Championship, Packers, Panthers, Patriots, pittsburgh, pittsburgh steelers, playoffs, prediction, predictions, Ravens, San Francisco 49'ers, Steel Curtain, steelers, SuperBowl, Terrible Towel4 Comments on Playoffs? Don’t Talk About Playoffs! !